Florida’s summers are long and hot, so when your sod starts to look dry, it’s an instinctive reaction to water it more… and more… and more. Unfortunately, too much water is just as dangerous as too little water. Learn to identify the signs so you can nourish your sod with the best amount of water and help it survive Florida’s harsh summer weather. Too much water drowns grass roots and causes the soil to become waterlogged. The roots slowly drown and rot, causing blades of grass to wilt and die. This isn’t the effect you want to see! Even if you don’t drown the grass roots entirely, you will unknowingly create a shallow root system that lacks the resilience of deeply rooted systems. Ironically, overwatering your lawn can even make your sod more vulnerable to drought, insects, weeds, and disease. First, reflect on your sod watering habits. 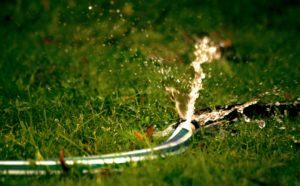 Do you leave your sprinkler in the yard with a “set it and forget it” mentality? Do you maintain the same watering schedule regardless of rainfall? If you answered yes to either question, you are most likely overwatering your sod. Help! How Do I Reverse Water Damage? Your sod is a major investment, so you want to take immediate steps to minimize and reverse overwatering damage. Fortunately, turfgrass is resilient and can recover with professional care. Call (813) 633-8665 to seek the help of Council Growers Sod, Tampa’s local sod professionals. The team at Council Growers Sod can help you resuscitate your sod and learn better watering habits that strengthen the root system rather than drown it.